We believe in fostering love for learning in all children. All children are smart, and the job of our teachers and parents is to help kids find the style of learning that lets unique natural intelligence shine through. We are putting the theory of MULTIPLE INTELLIGEENCE into practice. We recognize individuality of each child and let them learn at their phase . Our Moto is that kids should see learning as a part of life . Focus on overall development of children through sports, arts music and much more. Low student teacher ratio. So we can give maximum attention to every student. Additional benefits: We provide in house music class from a professional music teacher and Art class at the 104art studio in Motomachi. Step 1: Send in inquiry through email or contact us by phone. Step 2: Complete the registration at the school. Step 3: Follow up with Admissions. 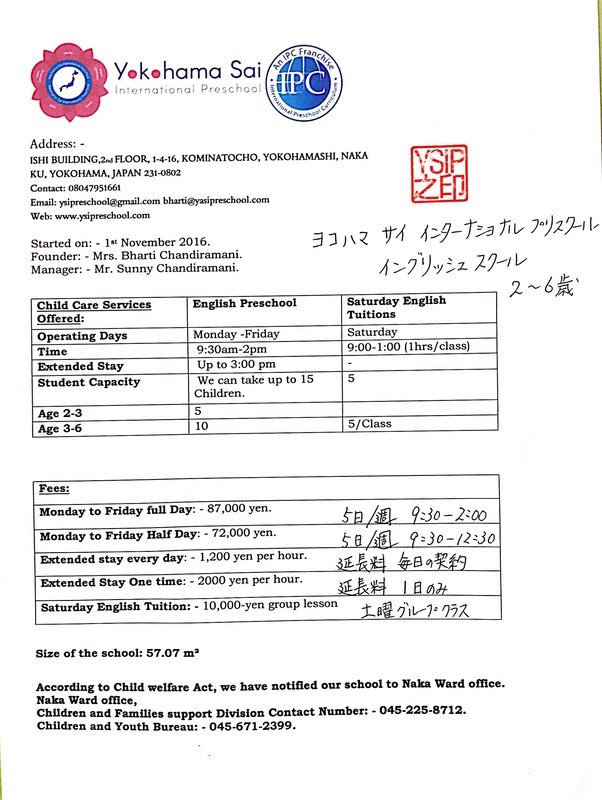 ¥ 87,000 for children opting for full day program. From 9:30am-2:00 pm. ¥ 72,000 for children opting for half day program. From 9:30am to 12:30pm. Music lesson once a month, by professional music teacher.